In the medium-to-long term, aggressive marketing in the Middle East can lead to higher market share. Deployment of more Drill-N-Ream fleet each quarter in 2019 can lead to higher revenues, while Superior Drilling’s marketing agreement with DTI can expand its market share. Current drilling activity headwind can slow down SDPI’s growth in Q1 2019. Superior Drilling Products (SDPI) provides drilling and completion tool technology, including horizontal drill string enhancement tools, new drill bit, and refurbish drill bits for the oilfield equipment & service (or OFS) providers. I expect SDPI’s stock price to increase over the medium-to-long term. 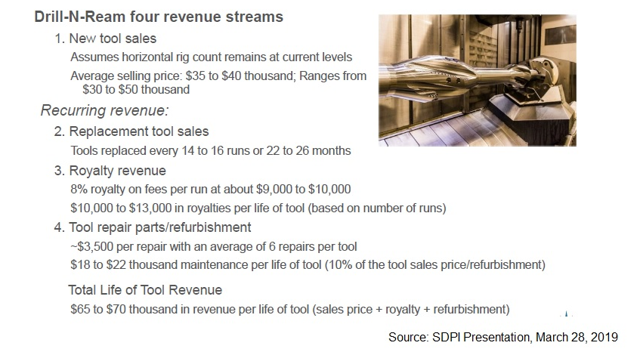 The primary driver for SDPI’s growth has been the sale of the Drill-N-Ream (or DNR) product used in horizontal drilling. Despite the weakness in the crude oil price in the second half of 2018, horizontal drilling activity did not hit any real pause. I expect the company’s sales in the U.S. to remain steady. More recently, one of its primary objectives has been to grow business in the Middle East. The company is building and enhancing new partnership programs to market its DNR fleet. However, the marketing initiative that can push sales in the Middle East will also lead to higher marketing and R&D costs, which can reduce SDPI’s near-term margin. Although the company has sufficient liquidity to meet its near-term obligations, it might need to improve its cash flows to avoid further strain on its balance sheet in the medium term. Superior Drilling’s marketing agreement with Drilling Tools International (or DTI) transformed it from a rental tool company to a manufacturer that designs, builds and sells tools. 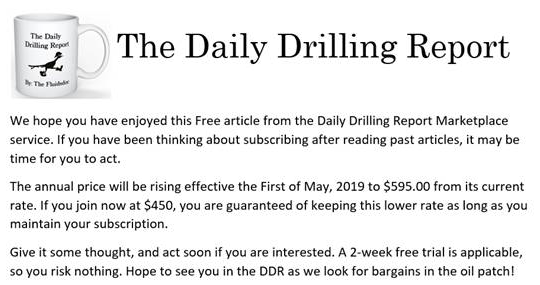 The deal, which is built on the condition of gaining market share for the Drill-N-Ream product, lasts through the end of 2022. Following the agreement, which was initially inked in May 2016, DTI purchases SDPI’s Drill-N-Ream tool for their rental tool business and achieve market share requirements in the U.S. and Canada. In turn, DTI holds the product’s exclusive marketing rights. Approximately 47 operators ran the tool in January 2019. While DNR's market share reached 11.6% at the end of 2017 by SDPI’s estimates, DTI would be required to achieve 22.5% market share by the end of 2019, and 25% by 2020. So, DNR can significantly pull the company’s growth forward. SDPI’s Drill-N-Ream wellbore conditioning tool increases the use of multiple tools in a single wellbore. The nature of the tool’s use leads to multiple revenue generation opportunities, including the initial sale of DNR, per run royalty, maintenance and repair, and product replacement. Currently, these tools are in the range of 8-inch to 12-inch series. The company has been receiving a request for larger-diameter tools. However, the production of the larger series will depend on the margin economics. While there are many single-section reaming tool manufacturers, SDPI’s management believes that the DNR tool is one of the few dual cutting-structure drill string reamers, which, along with the Strider technology, has a competitive advantage in the horizontal drilling market. SDPI has also found a partner that has been distributing Strider tools in Texas and Louisiana. The Strider technology or design reduces drill string friction on horizontal wells, resulting in improved rates of penetration and cost savings. While the smaller version of this tool is available in the market, the company is trying to offer the larger version in the second half of 2019. The longer tools would be more applicable in the long laterals. In the unconventional energy resources, horizontal drilling and long laterals techniques are primarily used. So, the longer version DNR tools are expected to be used increasingly in the U.S. shales. The most significant development for SDPI in recent times has been its expansion in the Middle East. The company has agreements to develop the market in that region with two global OFS companies. In November 2018, it signed a deal with Odfjell Drilling Ltd. Superior Drilling has already been operating in Kuwait and Saudi Arabia, and plans to start operations in Oman. It plans to increase its regional fleet to 60 in 2019. With Smith International Gulf Services, the company signed a contract for services which is expected to become operational in early 2019. The specification of DNR tools that can potentially be sold in the Middle East can turn out to be more profitable. In the U.S., SDPI primarily sells 12-inch products, which are considered to be high-end. However, in the Middle East, these tools are regarded as a medium range. The company’s management disclosed in the Q4 2018 earnings call that its designs for the 16-inch tools are ready and it can produce it economically. The company is receiving requests from the national oil companies (or NOCs) in the region. Superior Drilling has also resolved the logistics and serviceability issues there, after it set up the service agreements and marketing agreements, as I discussed above. It now looks to penetrate the Kuwait market. SDPI’s tool sales have been quite unsteady. While revenues from tool sales declined sharply both year over year in Q4 2018 (70% down) as well as quarter over quarter (74% down), for FY2018, revenues from tool sales and rental were resilient (2% down) compared to FY2017. The primary factor contributing to the Q4 2018 lower sales was lower DNR tool sales in the U.S. Also adding to the lower demand was DNR’s longer than previously expected tool life. Longer life means additional refurbishment per tool, but it did cause the overall sales to fall. Rental tool and tool sales accounted for 36% of the company’s FY2018 revenues. Interestingly, SDPI’s establishment of a new service center in Texas affected its tool sales. While the addition of the servicing center created greater logistical efficiency to the distributor, it led to a temporary reduction in the demand for additional tools for the deployed fleet. In Q4, marginally offsetting the adverse effects on lower tool sales were higher demand from the Middle East where upstream activity was relatively stable. The most significant increase in SDPI’s sales components was in the Other Related Tool sales. In this category, the FY2018 revenues increased by 68% compared to the prior year. Other Related Tool sales refer to the royalties and fleet maintenance fees, which increased due to the larger DNR tool fleet deployment in drilling operations. Revenues from Contract Services were steady in FY2018, while revenues from this category increased in Q4 2018 compared to a year ago. Investors may note that the company’s revenues from contract services are generated primarily from refurbishing PDC (polycrystalline diamond compact) drill bits for Baker Hughes, a GE Company (BHGE). SDPI renewed its contract with BHGE in 2018. According to the terms of the contract, it can manufacture drill bits for the mining industry as well. So, revenues from the contract services are largely steady as long as the contract with BHGE is in place, while giving some upside from its scope outside of the agreement. SDPI believes it can deploy more DNR fleet each quarter in 2019, which can lead to higher repair revenue and royalty revenue. 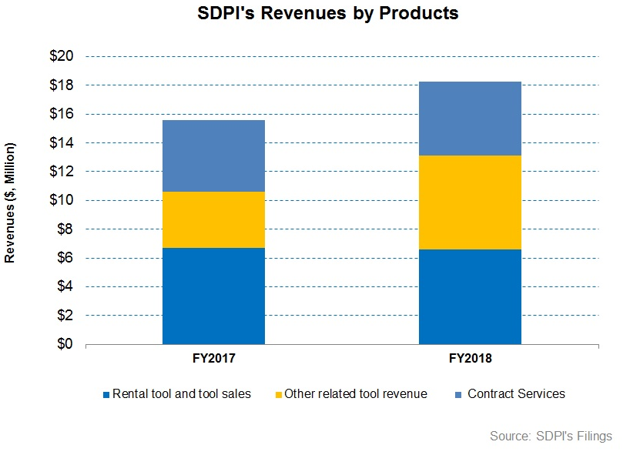 Up until early March 2019, SDPI’s tool sales revenue growth appears to be encouraging. So far this year, it has generated $1.5 million in new tool sales. As a result, we can expect more stable cash flow from the company in 2019. In FY2019, SDPI’s management expects revenues to grow by 15% to 30% compared to FY2018 to a range of $21 million to $24 million. Gross margin can range between 58% and 61% in FY2019, compared to 61% in FY2018. In the first half of the year, the larger-diameter DNR tools are expected to hit the market and would drive sales. However, in doing so, the company would spend on R&D in 2019. Also, the company’s efforts to increase sales would lead to higher marketing expenses through higher headcount, which can increase the SG&A costs, and lead to a lower operating margin. In FY2018, Superior Drilling’s cash flow from operations (or CFO) was $4.6 million, which was a 96% increase compared to FY2017. Led by a 17% increase in revenues, the improvement in the CFO reflects working capital improvement due to lower accounts receivable and inventories. The company's cash and cash equivalents were $4.26 million on December 31, 2018. In February 2019, SDPI secured a $4.3 million credit facility, which included a $3.5 million revolver. The company’s net debt-to-equity stands at 1.6x, which is lower than its peers’ average (Liberty Oilfield (NYSE:LBRT), Pioneer Energy (NYSE:PES), and Weatherford (NYSE:WFT)) of 4.1x. In FY2019, it is scheduled to repay $5.1 million of debt, while another $6.5 million would be due for repayment between 2020 and 2021 unless further refinanced. With insignificant capex, the company has sufficient liquidity (cash plus borrowings under revolving credit facility) and cash flow from operations to manage its near-term debt repayments. However, it needs to keep growing the CFO to avoid further strain on the balance sheet (with 1.6x net debt-to-EBITDA and 0.75x debt-to-equity). Investors may note that the company amended its debt agreement related to the Hard Rock acquisition. Under the new agreement, it has to repay $750,000 of principal in each quarter in 2019 and 2020. It could lose its right to market Drill-N-Ream if it is unable to make the payment. Approximately 54% of SDPI’s shares outstanding are held by the insiders. According to the data taken from the 2018 10-K, the executive officers and directors as a group had 45.4% of SDPI’s ownership as of February 22. This group includes G. Troy Meier, who is the Chief Executive Officer (CEO), and Annette Meier, the COO of the company. The CEO and the COO, through the Meier Family Holding Company and Meier Management Company, have significant ownership of SDPI, which gives the Meier family substantial control over the ownership of the company. What Does SDPI’s Relative Valuation Say? Superior Drilling Services is currently trading at an EV-to-adjusted EBITDA multiple of 8.5x. According to sell-side analysts’ estimates, the forward EV/EBITDA multiple is 5.0x. From FY2017 to FY2018, its average EV/EBITDA multiple was 11.2x. So, it is currently trading at a discount to its past two-year average. Superior Drilling’s forward EV-to-EBITDA multiple contraction versus its adjusted trailing 12-month EV/EBITDA is steeper compared to the industry peers’ average multiple compression, which means its EBITDA is expected to improve more sharply compared to the peers’ average in the next four quarters. This would typically result in a higher current EV/EBITDA multiple compared to the peers’ average. 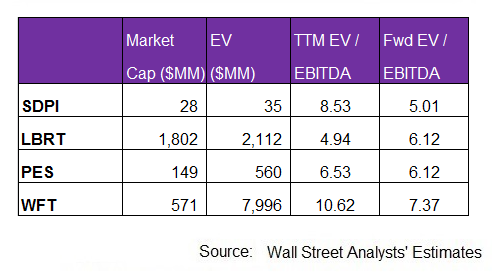 The company’s TTM EV/EBITDA multiple is higher than its peers’ (LBRT, PES, and WFT) average of 7.4x. I have used estimates provided by Thomson Reuters in this analysis. According to data provided by Seeking Alpha, two sell-side analysts rated SDPI a “buy” in March (includes strong buys), while none recommended a “hold” or a “sell”. The consensus target price is $2.5, which at the current price yields ~123% returns. What’s The Take On SDPI? The primary driver for SDPI’s growth has been the usage of its Drill-N-Ream product in horizontal drilling. Despite the weakness in the crude oil price in the second half of 2018, horizontal drilling activity did not hit any real pause. As a result, the company’s sales in the U.S. remained steady. More recently, one of its primary objectives has been to grow business in the Middle East. The company is building and enhancing new partnership programs to market its DNR fleet. To that end, it has found new market development partners. Its agreement with its principal customer BHGE for the PDC drill bits runs through 2022. However, SDPI’s near-term result can be negatively affected due to higher operating costs arising out of higher marketing and R&D costs in the Middle East. Its cash flow is not robust. Although the company has sufficient liquidity to meet its near-term obligations, it might need to improve its cash flows to avoid further strain on its balance sheet in the medium term. I expect the stock price to increase over the medium-to-long term.